TNC controls from HEIDENHAIN with Connected Machining offer numerous solutions for networking and data exchange, such as using e-mail directly on the control. 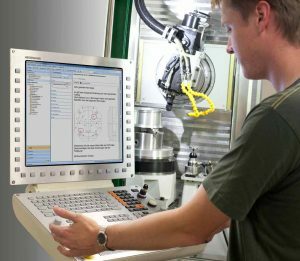 As part of the industry 4.0 area at EMO 2017, HEIDENHAIN presented a system of production in which all work steps are networked—from the design to the deliverable component. The core components of the network are the software solutions of Connected Machining. They provide TNC controls with access to all order-related data in the company network, so the specialist at the TNC control can become a director of the process chain. Designing in the CAD system, programming and preparation of the production data in the CAM system, simulation of machining on a virtual machine, tool preparation, tool measurement, tool management—all this has long been available in modern manufacturing. However, the smooth exchange of data between all persons and systems involved is in no way a matter of course. Here a lot of manual work is still on the agenda—in a better case a manually initiated data transmission, in the worst case the passing on of handwritten notes. The workpiece is made on the machine, so all information must come together here. 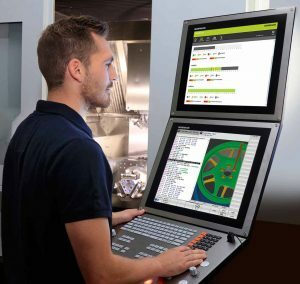 And from here, crucial information about the status and quality of a workpiece must also flow back into the IT systems of production—i.e. into the process chain. The machinist responsible for the quality of the components and for staying on schedule must have access to all the data and must be able to apply his experience in manufacturing to the process chain. There are many ideas for the networking of all persons and systems involved in the process. But under these considerations, making the machine control in the workshop the focal point of a company network has a very special charm. This is illustrated by the networked production that HEIDENHAIN is presenting together with partners from the areas of CAD/CAM, machine tools, tool measurement, and tool management in the industry 4.0 area at EMO 2017. The fixed blanks are lying on a pallet at the machine for pending work. Calibrated tools are already loaded in the machine’s tool magazine. They are clearly identified by a code on the tool holder. The TNC operator used a scanner to read this identification when he loaded the tool magazine, so the TNC 640 knows which tools are available in the machine. The data comes directly from the tool management over the HEIDENHAIN DNC interface. 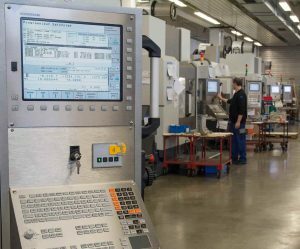 Connected Machining makes it possible to integrate the workshop in an efficient process chain via the TNC control. Using the Remote Desktop Manager, the TNC operator can directly access the CAM system from the TNC 640 control. For its part, the CAM system returns to the tool database for program creation. Using the Batch Process Manager of the TNC 640, the TNC operator can now schedule execution of the production job on the machine. In the Batch Process Manager, NC programs and the position of the clamped workpiece on the pallet are linked with respect to the order and sorted into the list of open orders by priority. The Batch Process Manager enables the TNC operator to schedule several production orders simultaneously. The control supports this by once again comparing the tools used in the NC program with the tools actually available on the machine. The control then reports any tools that are missing, and states the estimated machining time. The TNC operator can then, for example, output a list of tool differences: this list contains only those tools that still need to be prepared. The information about the estimated machining time can also be used for further order planning, such as subsequent jobs for the machine or the further logistics of the finished parts. This information is also used together with information from the tool management to order new tools. The new StateMonitor software supports the TNC operator in this regard. StateMonitor captures the data of connected machines, presents a real-time view of the machine status, and can send messages to computers throughout the company as well as to mobile devices. StateMonitor also uses the DNC interface. The tool preparation station then immediately receives orders for any additionally required tools. This also applies to series production runs that are currently underway. StateMonitor can send a message to the tool preparation station if a tool’s age is approaching a critical value and this is detected by the NC program. Based on the data stored in the tool management, the tool preparation station can then promptly prepare new tools in the tool presetter for calibration. In this case as well the data of the exact tool settings are sent to the tool management. The pre-set tools are given their own code on the tool holder for unambiguous identification. The CAM program and the virtual machine then also have access to this exact data. All information is clearly visible with the TNC 640, Extended Workspace, and StateMonitor: The second screen shows information from StateMonitor, and the control’s screen shows the running NC program. The final, automatic workpiece measurement on the machine delivers important data for quality assurance. This data can simply be archived or it can be evaluated. Naturally the data is also centrally available to all other systems, meaning that from the NC program to the tools, all links of the process chain can be optimized. 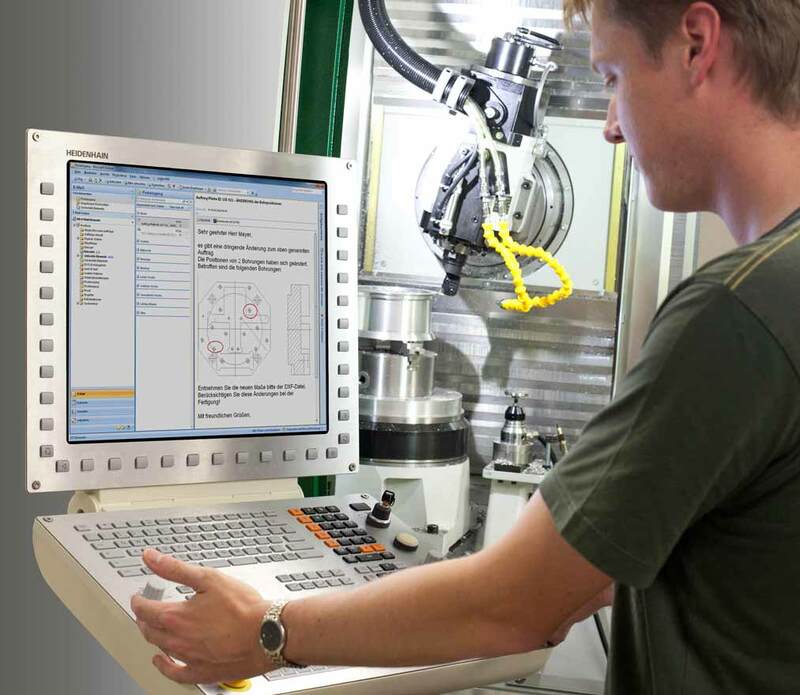 The core components of Connected Machining are the HEIDENHAIN DNC interface, the Remote Desktop Manager, and the StateMonitor software. The HEIDENHAIN DNC interface establishes the connection to enterprise-resource planning systems and production-activity control systems, and also links StateMonitor to the company network, whereas the Remote Desktop Manager provides access to all Windows applications. Also, numerous useful functions for data presentation, such as viewers for PDFs and graphic files as well as for CAD files in STEP or IGES format, are a standard feature of TNC controls from HEIDENHAIN. A browser is also installed on the control. All that’s left is to simply connect the control to the company network over an Ethernet connection. 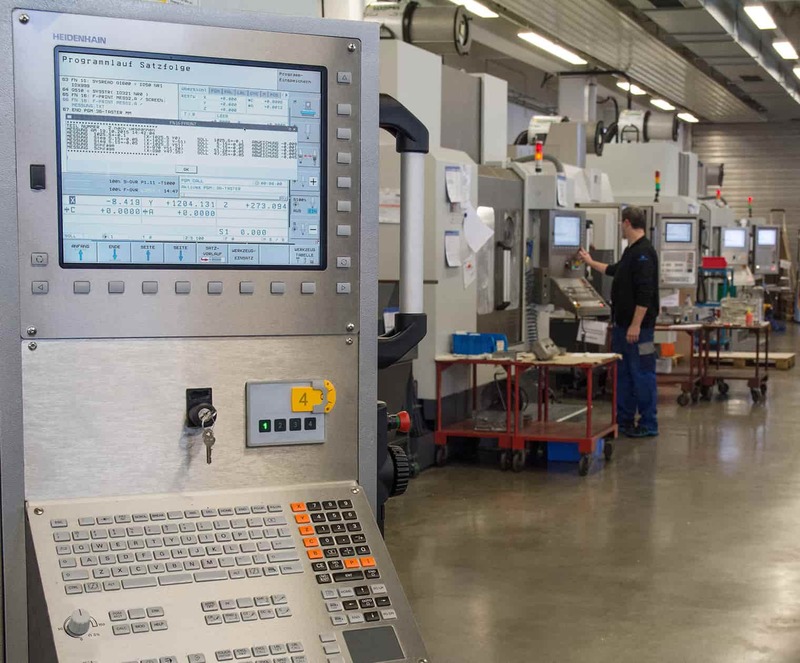 The solutions provided by Connected Machining are universally adaptable to the individual circumstances of a production department, meaning that every company can design its process chain according to its own needs and desires. The various functions and software solutions thus link the production department to a process chain with a uniformly digital flow of information. This can be done completely independently of the solution chosen, regardless of the respective downstream systems. Our goal is the greatest possible flexibility for our customers. They can adapt, configure, and implement the solutions from HEIDENHAIN themselves.